Additional research provided by David M. Egner. Horse racing was the most popular spectator sport in North Carolina from the colonial period until after the Civil War. As early as the 1730s writer John Brickell noted residents' fondness for it. Early horse racing was crude and often dangerous. It began to become more refined in the last two decades before the Revolution, when planters imported expensive English breeding stock to Virginia and North Carolina. 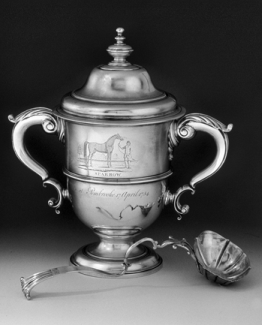 Gradually plantation owners with the financial resources to purchase, breed, train, and race horses dominated the sport, which became a way for North Carolina's financial elite to display their wealth. This group included such prominent North Carolinians as Willie Jones and Jeptha Atherton. Gambling on horse races was widespread among all classes. The Wilmington Jockey Club was established in 1774. The famous race horse Janus was kept in North Carolina during the 1770s, establishing an enviable breed of thoroughbreds. Horse racing expanded its hold after the American Revolution, as jockey clubs were established in every region, annual races became major social events, and horse breeding became big business. It became necessary to standardize racing weights, distances, and other variables. As a result horse racing became the first sport to become bureaucratized. The preferred distance for the top thoroughbred races was four miles, the so-called "heroic distance." The center of North Carolina racing in the antebellum era remained the region near the Roanoke River. That area was the home of the state's most famous race horse, Sir Archie (1805-33), a horse so successful that his career ended after only a handful of races because his owner could find no competition. Sir Archie's owner at that time was Warren County native William Ransom Johnson, a well-respected trainer and owner known by the national racing fraternity by his nickname "Napoleon of the Turf." Johnson eventually moved to Virginia but not before selling Sir Archie to former governor William R. Davie. Eventually Northampton County planter William Amis acquired Sir Archie, putting the horse at stud at his Mowfield Plantation. 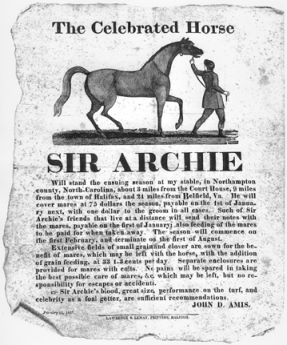 Sir Archie became one of the most successful studs ever, with the careers of his 400 progeny leading to his designation as the "Foundation Sire of the American Thoroughbred." Many champions trace their line through Sir Archie. The Civil War ended the plantation system upon which southern horse racing had been established. Despite the disappearance of the jockey clubs, however, horse racing continued to be a popular activity at the North Carolina State Fair in Raleigh and at regional and county fairs. These races were much shorter than those in the antebellum period-usually about one mile-and, at the fairs, were almost evenly divided among flat and harness racing. The advent of the automobile in the early twentieth century further marginalized horse racing, and the sport eventually disappeared from the fair circuit. But horse racing never completely disappeared. In the early 1950s, steeplechases became popular at Stoneybrook Stables near Southern Pines. The mountain community of Tryon also has hosted successful steeplechase races. In 1992 harness racing was reintroduced at the state fair after an absence of decades. By the late twentieth century, however, big-time horse racing had become closely connected to gambling, an illegal activity in North Carolina. Several attempts have been made to institute pari-mutuel gambling in the state, but by 2006 none had gained legislative approval. Elizabeth Amis Blanchard and Manly Wade Wellman, The Life and Times of Sir Archie: The Story of America's Greatest Thoroughbred, 1805-1833 (1958). Henry W. Lewis, "Horses and Horsemen in Northampton before 1900," NCHR 51 (April 1974). Alexander Mackay-Smith, The Colonial Quarter Race Horse (1983). Jim L. Sumner, "The State Fair and the Development of Modern Sports in Late Nineteenth-Century North Carolina," Journal of Sport History 15 (Summer 1988). 1 January 2006 | Egner, David M.; Sumner, Jim L.